The radio designed for long-range AM Reception and now Emergencies! 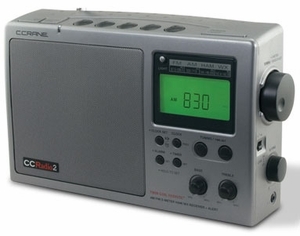 The new CCRadio-2 has the same familiar look and layout as previous models of the CCRadio but with even better AM Reception and the addition of the 2-Meter Ham Band. The boost in AM performance comes from our patented Twin-Coil Ferrite(r) AM Antenna, and other improvements built into the CCRadio-2. AM stations continue to sound just right, thanks to audio that's optimized for voice clarity. After you select a station, the CCRadio-2 evaluates the signal for several seconds and then locks in for the highest signal possible. FM reception is a little better than the CCRadioplus while the Weather Band can keep you informed of any government-issued alerts. The addition of the 2-Meter Ham band may make the CCRadio-2 a life saver during an emergency like hurricane Katrina. 2-Meter Ham operators are early on the scene and they donate their time while handling perhaps 90% of the emergency coordination efforts. The CCRadio-2 can act like a simple radio scanner and search the five memories for ham operator communications. The sensitivity (squelch) can be adjusted for best results. More information about the 2-Meter Ham Band can be found at CCRadio.com/2-meter. The CCRadio-2 comes in our original Black Mica or a new Titanium color. It features a brighter, clearer LCD display with a full backlight and three levels of adjustable brightness plus an "off " setting. Five years ago we made changes to the durability of our CCRadio LCD display that have proven to be robust. Other features include: 5 memories per band (AM, FM, Weather and 2-Meter bands), adjustable display light, adjustable bass and treble, clock alarm, sleep timer, auto scan, stereo headphone jack, line-input jack, and line-output jack.